How Far is Silver Spring? Located in Anakaputhur, Kancheepuram district in Chennai, Silver Spring offers exquisitely designed 2BHK apartments in two sizes for a comfortable living. 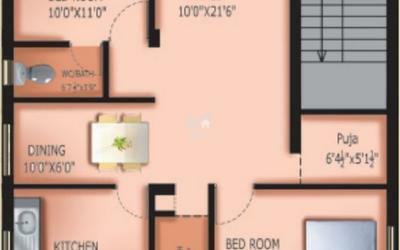 The apartments in the project boast spacious balconies and are well-equipped with all amenities. 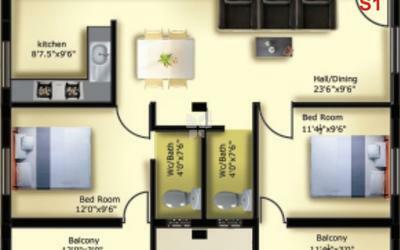 USP: Spacious homes with all modern facilities. The layout provides power back up, rainwater harvesting, parking and security. Interested buyers can avail loans from any of these national banks – Axis Bank, HDFC Home Loans, Union Bank, and LIC HFL. The project is developed by GK Properties. R.C.C. Framed structures as per structural design 9 "and 41/2" thick Brick wall as per working drawing Plastering as per standard. Main Door:Teak wood frame with 30mm thick teak / veneer panel shutter. Windows : Wooden frames Aluminium openable with glazed shutter. FLOORING 2"X2" Virtified tile flooring (Cost Rs 42/-). DADOING for Bathroom 7' height glazed tiles (Cost Rs 25/-). Kitchen Counter Black Granite Top ceramic tiles 2' above platform, S.S.sink without drain board. Hot Water lines: CPVC pipes with necessary fittings. Cold waterlines: PVC pipes Conforming to IS. Rain water and Sanitary line : PVC pipes Conforming to IS. Parryware or Hindware / metro cp fittings Rain water Harvesting with necessary arrangements. Concealed Wiring Wires conforming to IS Switches Anchor or any standard make. All Internal walls: 2 coat putty finish with plastic. External walls: Exterior Emulsion Paint Emulsion Paint. Doors, Windows & Grills :Synthetic Enamel paint. The Cost of apartment is exclusive of Covered car parking, Registration, Stamp Duty, Incidental N charges, Deposits Payable to TNEB, Underground Drainage, sales Tax and Other Government Taxes. Welcome to the home of G.K.Properties. This is the place where you can find some of the finest homes in chennai. 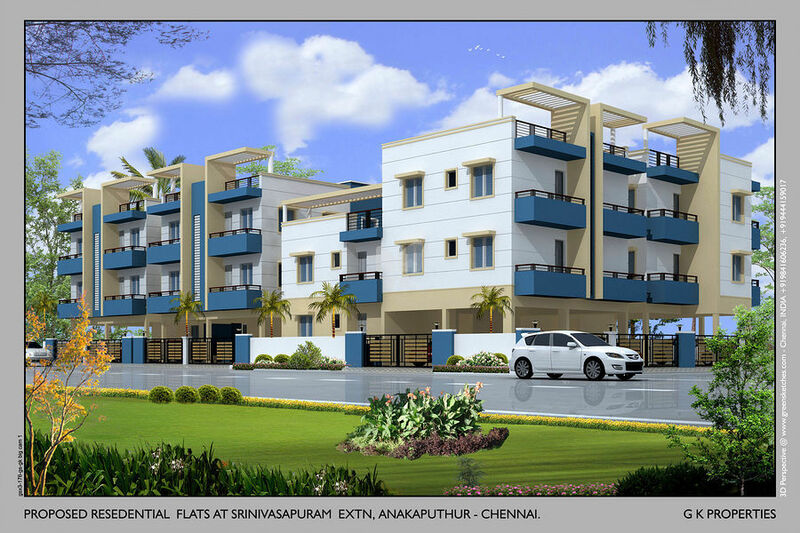 We have successfully completed 25 residential projects in chennai since 1999. We have long list of highly satisfied customer base. Just have a visit to our completed or ongoing projects, you will be convinced that G.K.Properties stand apart in quality, aesthetics, perfections, value for money and above all giving you total peace of mind.Our homes are designed by well experienced architects. Hence the building has good ventilation and aesthetic finishes and good elevation. Excellence in every sphere of construction is our motto. From basement to finishing we adhere to the best standards. Our past achievements speak for our future performance.By just entering G.K.Properties you will know that buying an apartment is a very pleasant experience. We take care of all your requirements and in the process we give you total peace of mind.